Ordering food for the office can be fun the first time you do it. The second time you do it, maybe not so much. After hearing everyone’s very specific requests and restrictions, you realize this “simple” thing is not so simple after all. Greasy fast food just won’t cut it. Try our delicious sandwiches for your team lunch. 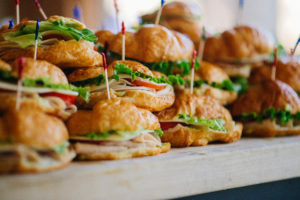 And if you’ve had to order food for countless office lunches, meetings, gatherings, trainings, retreats, and workshops, you know that wrangling your office catering can be the hardest part of your job. #1: Choose boxed lunches if the focus is on work. Perfect for a presentation, debrief session, or lunch-and-learn, the boxed lunch helps people focus on a working session. We offer classic brown bag lunches as well as boxed hand-carved sandwiches in our cold lunch catering. 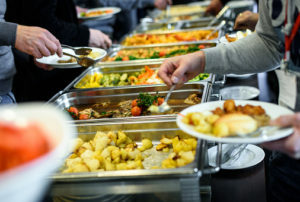 #2: When the focus is on celebration, select the hot buffet option. When a cold cut won’t cut it! Taking the time to celebrate an achievement or retirement? A hot lunch can really bring the team together. Choose favorites like Italian or Mexican cuisine and see our full hot lunch menus here. #3: Kick back with BBQ. Nothing beats our BBQ. And nothing is quite the crowd-pleaser that finger-lickin’ ribs and melt-in-your-mouth pulled pork can be. Check out our BBQ menus—and of course, we include our famous Grampa’s Grille sauce. We offer off-site catering with easy ordering and an array of delicious options to bring your team together. Most of our packages start at just 15 guests, so even smaller gatherings are within reach. With more than 60 years of catering experience, we know just what you need, too. From extra BBQ sauce to more napkins, we have all the details covered. With our mouthwatering fare and expert service, you can relax and enjoy the meal, too. Maybe the next time you’re tasked with catering lunch, you’ll feel it’s the best part of your job.